The antiestrogen ICI 182,780 has been used successfully as an alternative experimental model for the study of estrogen action in the rodent adult male reproductive tract. Although ICI 182,780 causes severe alterations in testicular and efferent ductule morphology and function, the effects on the expression of estrogen and androgen receptors in the male have not been shown. In the present study, adult male rats were treated with ICI 182,780 for 7 to 150 days, to evaluate the time-response effects of the treatment on the pattern of ERα, ERβ and AR protein expression in the efferent ductules. The receptors were localized using immunohistochemistry. ERα, ERβ and AR have distinct cellular distribution in the testis and efferent ductules. Staining for ERα is nearly opposite of that for ERβ, as ERα shows an increase in staining intensity from proximal to distal efferent ductules, whereas ERβ shows the reverse. Androgen receptor follows that of ERα. ICI 182,780 caused a gradual but dramatic decrease in ERα expression in the testis and efferent ductules, but no change in ERβ and AR expression. 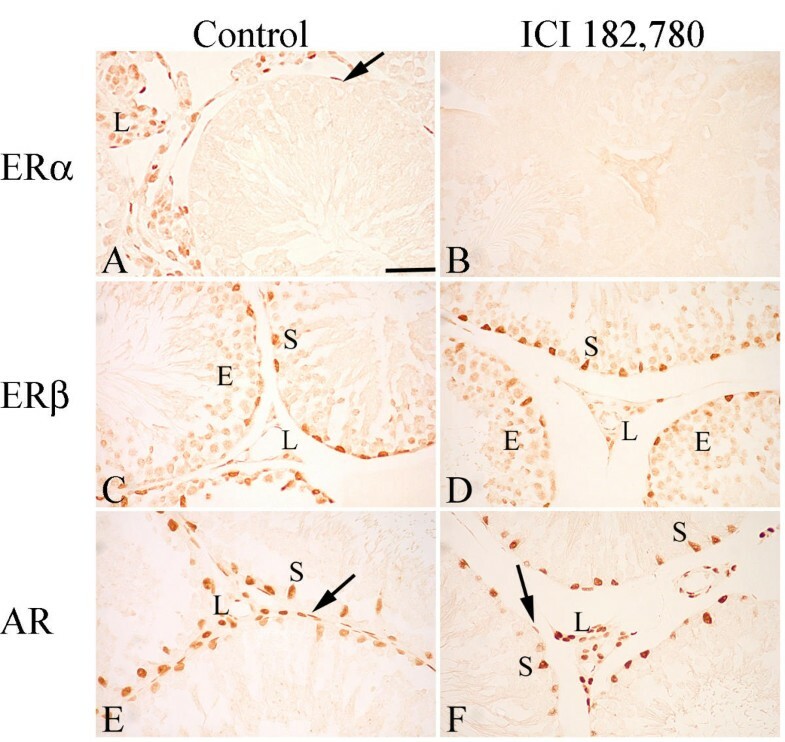 The differential response of ERα and ERβ proteins to ICI 182,780 indicates that these receptors are regulated by different mechanisms in the male reproductive tract. The efferent ductules express significant levels of the two subtypes of estrogen receptor, ERα and ERβ , which can be co-localized in the epithelial cells of several species [2–6]. Targeted disruption of the ERα in the mouse (αERKO) or both ERα and ERβ (αβERKO) caused abnormalities in the efferent ductules and impaired male fertility [7–12]. This is in contrast with the reproductive tract phenotype of the ERβ knockout mice (βERKO), which are fertile [11, 13]. These results highlighted the importance of the efferent ductules and a functional ERα for the male reproductive tract. ERα and ERβ possess remarkable similarities to one another, but they also possess individual characteristics that suggest functional differences [14–16]. Structurally, the rat ERα and ERβ have 95% identity in the DNA binding domain, but no more than 55% homology in the ligand binding domain . As a consequence, different binding affinity for a variety of estrogenic and antiestrogenic compounds [17, 18] and different transactivation activity depending on ligand and response element for the ERα and ERβ has been reported [16, 19–22]. Therefore, different responses of ERα and ERβ to ligands in different tissues can be expected. Treatment of rodents with the antiestrogen ICI 182,780 has been shown to be an alternative and efficient experimental model for the study of estrogen action in the male reproductive tract, bypassing the problems of developmental estrogen receptor absence seen in the transgenic mice [12, 23–26]. ICI 182,780 is a potent steroidal antiestrogen, which can bind to both ER subtypes [16, 17, 27], but the binding patterns for ICI 182,780, as well as for estradiol, are distinct on both ERα and ERβ . Long-term treatment with ICI 182,780 promoted adult dysfunctional changes in the rat efferent ductules and culminated in testicular atrophy and infertility  similar to changes observed in the α ERKO male [8, 9]. Changes in efferent ductules included luminal dilation (up to 200%), gradual reduction in epithelial height and transient increase in lysosomal area and microvilli height in nonciliated cells. Extending these results, a recent study established the time course of the events that led to testicular atrophy and infertility in rats after ICI-treatment and showed that effects on the efferent ductules preceded the adverse effects in the testis . Although these studies are the first to demonstrate that a functional ER is essential for fertility in the rat and for maintenance of efferent ductules morphology, the molecular effects of ICI 182,780 on the expression of ER in the male have not been determined. Given the potential importance of estrogen for the male reproductive tract function [9, 29, 30] and the known effects of the antiestrogen ICI 182,780 on testis and efferent ductules [12, 23, 25, 26], we investigated the mechanism of ICI 182,780 effects, looking for alterations on the pattern of ERα and ERβ protein expression in the rat efferent ductules. In addition, the expression of androgen receptors (AR) was also analyzed, given the known dependence on androgens for male tract function and the partial overlap of cellular distribution for AR and ERs [2, 31, 32]. It is well established that neonatal estrogen exposure causes alterations in the expression of AR [3, 33–35]; therefore, we hypothesized that ER disruption in the adult could also alter AR expression in the male. Our results show that ICI 182,780 causes a dramatic decrease in ERα expression in the efferent ductules, but no change in ERβ and AR expression was observed throughout the study period. Male Sprague-Dawley rats, 30 days old, were purchased from Harlan Bioproducts (Indianapolis, IN) and housed in a light (12 h of light, 12 h of darkness) and temperature (22°C) controlled environment. They were fed with commercial diet (Teklad Chow-Harlan Teklad, Madison, WI) and provided tap water ad libitum. All animal experiments were approved by the University of Illinois Division of Animal Resources and conducted in accordance with the Guide for the Care and Use of Laboratory Animals . The rats were treated once per week with subcutaneous injections of ICI 182,780 (Faslodex – provided by AstraZeneca, Macclesfield, UK), at a dosage of 10 mg/animal in a volume of 0.2 ml of vehicle. This dosage was found to be effective for inducing effects on rat efferent ductule without inducing significant differences on body and sexual gland weights, as well as in plasma testosterone and LH levels [25, 26]. The control group received the same volume of castor oil. The treatment was initiated when the rats were 30 days old and the animals were euthanized on Days 7, 15, 45, 73, 100 or 150 after the beginning of the treatment. 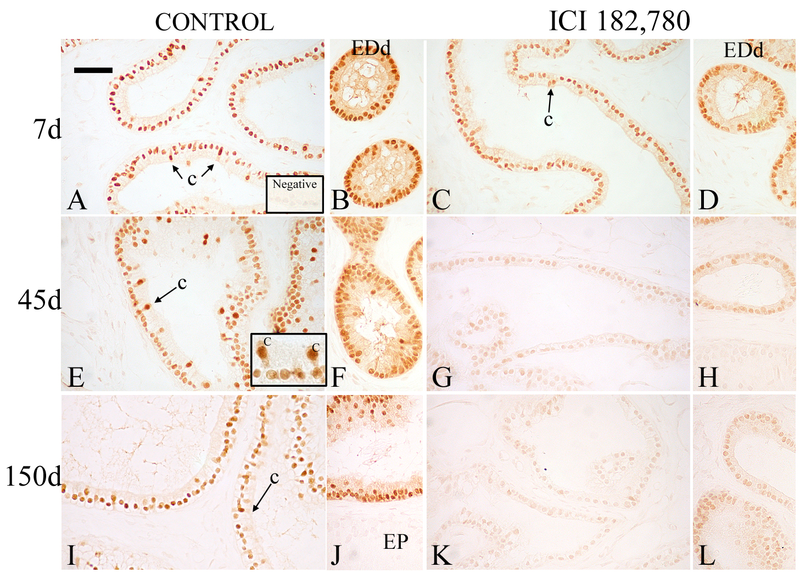 ERα, ERβ and AR proteins were localized by immunohistochemistry in testes and efferent ductules of matched control and ICI 182,780 treated rats (3 animals per group). The rats were anesthetized (i.p. sodium pentobarbital 0.1 ml/100 g BW) and perfused intracardially with 10% neutral buffer formalin (NBF). After fixation, the efferent ductules were dissected out from the testes and epididymides. The efferent ductules and fragments of the testes were embedded in paraffin, sectioned at 5 μm and mounted on electrostatically charged glass slides. A mouse monoclonal antibody raised against the full-length human ERα, the NCL-ER-6F11 (Novocastra Laboratories, Newcastle, UK), was used for immnunolocalization of ERα. The Genbank sequence data for the A/B region of rat and human ERα showed approximately 92% of similarity and this antibody does not cross-react with ERβ . For ERβ detection, an affinity purified sheep polyclonal antibody (S-40) directed against a peptide specific for the hinge domain (D) of human/rat ERβ was used . The specificity of the ERα and ERβ antibodies was confirmed by Western blot analysis and the validation for use in rat male reproductive tract was previously shown [4, 37]. AR was detected by an affinity purified polyclonal antibody (PG21-29) developed against a peptide corresponding to the first 21 amino acids of the rat/human androgen receptor [38, 39]. The immunohistochemical procedure was similar for all receptors. Tissue sections from treated and control animals at each time point were run in parallel, and the staining was performed in three different sets using one animal of each time point per set to confirm the results. Sections were dewaxed in xylene, rehydrated through a graded series of ethanol, washed in distilled water and phosphate buffer saline (PBS) and then blocked for endogenous peroxidase by incubation with 0.6% H2O2 in methanol for 30 min. The sections were subjected to antigen retrieval procedure by microwave irradiation in 0.01 M sodium citrate buffer pH 6.0. After washing in PBS, the avidin-biotin non-specific binding was blocked using a Vector blocking kit (Vector Laboratories, Burlingame, CA). Additional washing in PBS was performed before the next 30 min incubation in 10% normal goat or rabbit serum, for ERα, AR and ERβ respectively, to prevent nonspecific binding of the antibodies. The sections were incubated overnight at 4°C with the respective primary antibody. The dilution of the antibodies used was 1:500 for ERα and AR, and 1:1000 for ERβ. For negative controls, the sections received PBS in place of the primary antibody. Prostate and testis tissue were used for positive control of the ERβ and AR, respectively. Because the efferent ductules are known to express high levels of ERα , they served as its own positive control. After washing in PBS, the sections were exposed for 1 h to a biotinylated secondary antibody goat anti-mouse (for ERα) (Dako, Carpinteria, CA), rabbit anti-sheep (for ERβ) (Vector, Burlingame, CA) and goat anti-rabbit (for AR) (Dako, Carpinteria, CA), all used at 1:100 dilution. After this step the sections were incubated with the avidin-biotin complex (Vectastain Elite ABC kit – Vector Laboratories, Burlingame, CA) for 30 min. To visualize the immunoreaction, sections were immersed in 0.05% 3,3' diaminobenzidine containing 0.01% H2O2 in 0.05 M Tris-HCl buffer, pH 7.6. The reaction was monitored microscopically and stopped by immersion in distilled water, after a brown color staining was visualized in control sections. Sections were finally dehydrated in ethanol, cleared in xylene and mounted. Sections stained for ERβ and AR were slightly counterstained with Mayer's hematoxylin before dehydration. Digital images from immunohistochemical staining from efferent ductules of treated and control animals were captured. ERα on days 15, 45 and 150, ERβ and AR on day 150 were analyzed. In Adobe Photoshop (San Jose, California), the images were first adjusted to equalize the background across all images to a white color. Ten nuclei with a well-defined edge from three different efferent ductules per animal (3 animals per treatment) were pasted onto a new image for import into IPLab software (Scanalytics, Inc., Fairfax, VA). Then the mean intensity of particles per nucleus was determined after segmentation to provide complete nuclear identification. Pixel intensity means were analyzed first by One-way ANOVA followed by the Student-Newman-Keuls multiple comparisons test to detect differences between control and ICI-treatment, at individual time points. Results are presented as Means ± SEM (Table 2) and significant differences are indicated by different superscript letters. The rat testis and efferent ductules expressed ERα and ERβ, as well as AR, and the antiestrogen ICI 182,780 induced different alterations in the expression of these receptors (Table 1). Distinct cellular distribution was observed for all receptors analyzed. ERα expression was predominately expressed in the testicular interstitial space (Fig. 1) and the efferent ductule epithelium (Fig. 2). In contrast, ERβ and AR were found more widely expressed in the testis (Fig. 1), rete testis, efferent ductules and initial segment of the epididymis (Fig. 3 and 4). Longitudinal sections of the efferent ductules allowed the analysis of labeling intensity in different regions of the organ (proximal, conus and terminal region) simultaneously. Immunoreactive product was not observed in the sections when PBS replaced the primary antibody. 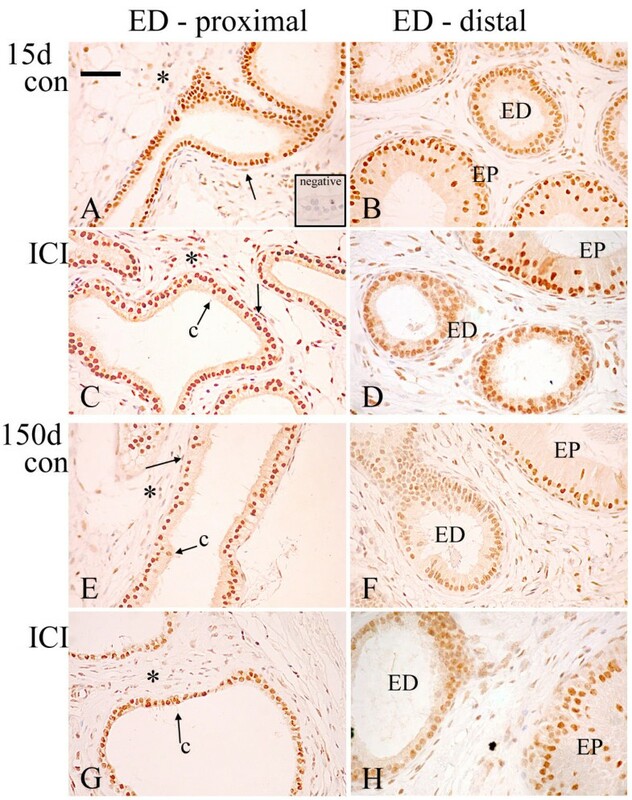 Comparison of immunohistochemical staining for ERα, ERβ and AR in the testis, efferent ductules and initial segment of the epididymis of control and ICI 182,780 treated rats, as observed after 150 days of treatment. SC = Sertoli cells; GC = germ cells; LC = Leydig cells; PC = peritubular myoid cells; ED-P = proximal efferent ductules; ED-D = distal efferent ductules; IS = initial segment of the epididymis; Con = control; ICI = ICI 182,780 treated; - = negative; + = weak stain; ++ = moderate stain; +++ = strong stain; ++++ = strongest stain; -/+ = intermittent stain; +++/+ = variable intensity of stain depending on the seminiferous tubules stage. Quantification of immunohistochemistry for ERα, ERβ and AR in the efferent ductules of control and ICI 182,780 treated rats. Pixel intensity per unit area of the nucleus was determined and means ± SEM are reported. Significant differences are indicated by different superscripts (P < 0.05) based on ANOVA one way-analysis of variance. Effects of ICI 182, 780 in the expression of ERα, ERβ and AR in the rat testis. (A) Leydig cells (L) and some myoid cells (arrow) are positive for ERα in the control rats. (B) ERα immunostaining is not detected after 100 days of ICI treatment. (C) ERβ was strongly expressed in the Sertoli cells (S) and slightly expressed in the germ cells in the seminiferous epithelium (E) and interstitial cells (L). (D) The ERβ expression was unaffected by the ICI treatment, as shown at day 45. (E) AR expression was found in the Sertoli cells (S), Leydig cells (L) and peritubular myoid cells (arrow). (F) There were no detectable effects on the AR expression after ICI treatment, as shown at day 45. Bar in A = 50 μm. Effects of ICI 182, 780 on the expression of ERα in the rat efferent ductules. In the control rats (A, B, E, F, I, J), ERα was expressed in the nuclei of ciliated (c) and nonciliated cells in the efferent ductules epithelium. Cytoplasmic staining was observed in the ciliated cells (c) at the proximal tubules (A, E, I and insert in E) and in both cell types in the distal tubules (EDd) (B, F, J). After 7 days of ICI treatment (C, D) a slight decrease in ERα was observed along the efferent ductules. On day 45 (G, H), ERα expression was greatly decreased with the treatment. On day 150 (K, L), the ERα expression was further decreased. Insert in A represents the negative control. Bar in A = 50 μm. In the testis, ERα was immunodetected in nuclei of Leydig cells and some peritubular myoid cells (Fig. 1), whereas the seminiferous epithelium and rete testis were negative (Fig. 2). The Leydig cells were stained moderately to weakly positive. The efferent ductule epithelium was stained intensely positive for ERα (Fig. 2), but the initial segment of the epididymis was negative (Fig. 2). In the efferent ductules, ERα was located in both ciliated and nonciliated cell nuclei. However, staining intensity did vary throughout the efferent ductules, from proximal to distal regions. At the proximal end of the ducts, adjacent to the rete testis, the ciliated cells showed a more intense nuclear staining for ERα compared to the nonciliated cells (Fig 2E), but the nonciliated cell nuclear staining reached its strongest intensity in approximately the middle of the proximal region and staining intensity continued into the conus and common efferent ductules. Another interesting difference in staining in the proximal efferent ductule region was the presence of cytoplasmic staining for ERα in the ciliated cells, which contrasted with the strictly nuclear staining in the nonciliated cells (Fig. 2A, 2E, 2I). A slight cytoplasmic staining was also observed in nonciliated cells in the conus and terminal regions (Fig. 2B, 2F, 2J). ICI 182,780 caused ERα down-regulation in efferent ductules at all time points analyzed (Fig. 2) and also in the testis (Fig 1). At day 7 there was a slight decrease in the ERα expression when control and ICI-treated animals were compared. Pixel analysis of the immunohistochemical staining revealed significant decreases (P < 0.05) in intensity on days 45 and 150 for ERα (Table 2). On days 100 and 150 (Fig. 2), ERα down-regulation was nearly complete, reaching levels nearly undetectable. Down-regulation of ERα was more pronounced in the proximal region of the efferent ductules (Fig. 2). Positive staining for ERβ was detected in the nuclei of the rete testis, efferent ductules and initial segment epithelial cells, as well as endothelial and some stromal cells (Fig. 3). An intermittent ERβ positive staining was seen in smooth muscle cells surrounding the efferent ductules. The staining was weaker in the efferent ductule epithelium compared to that of the initial segment of the epididymis. There was a gradient of epithelial ERβ immunoexpression, with stronger staining at the proximal ducts than the distal region of the efferent ductules. In the testis, positive staining was present in the Sertoli and germ cells (Fig. 1). Sertoli cells were the most intensely stained for ERβ, independent of the stage in the cycle of the seminiferous epithelium. A slight staining of Leydig cells was occasionally found. In the ICI-treated rats, no detectable change in ERβ expression pattern was found in the testis, efferent ductules or initial segment compared to controls at all time points investigated (Fig. 1 and 3). There was no statistical difference in mean pixel intensities for ERβ between control and treatment nuclei (Table 2). Effects of ICI 182, 780 on the expression of ERβ in the rat efferent ductules. In the control rats (A, B, E, F), ERβ was expressed in the nuclei of the efferent ductules epithelial and some stromal cells (*). An intermittent staining was also detected in the peritubular cells (arrow); (c) ciliated cells. Insert in A represents the negative control. The ERβ staining was stronger in the efferent ductules proximal tubules and initial segment of the epididymis when compared to the efferent ductules distal tubules. There were no detectable changes in the efferent ductules ERβ expression after ICI treatment (C, D, G, H). EP = epididymis. Bar in A = 50 μm. Immunoreaction for AR was detected in the nuclei of ciliated and nonciliated cells of the efferent ductules, in addition to peritubular and some connective tissue cells; including smooth muscle cells of the vascular walls (Fig. 4). The peritubular cells were strongly stained throughout the efferent ductules, but a gradient of AR expression was observed for the efferent ductule epithelium. AR staining in the epithelium increased from the proximal to distal region. Rete testis and initial segment epithelial cells were strongly positive for AR in both epithelial and stromal cells. Staining of the initial segment epithelium was stronger than that in efferent ductules. In the testis, nuclear AR-positive staining was detected in Leydig, Sertoli, peritubular myoid cells and vases smooth muscle cells (Fig. 1). In the Sertoli cells the intensity of AR expression varied depending upon the stage of the cycle of the seminiferous epithelium. ICI 182,780 failed to alter the pattern of expression of AR in the testis, rete testis, efferent ductules and initial segment of the epididymis compared with the respective controls at any time point studied (Fig. 1 and 4). There was no statistical difference in mean pixel intensities for AR between control and treatment nuclei (Table 2). Effects of ICI 182, 780 on the expression of AR in the rat efferent ductules. In the control rats (A, B, E, F), AR expression was found in the nuclei of the efferent ductules epithelial, peritubular (arrow) and some stromal cells (*). The AR staining in the proximal tubules was weaker than that on distal tubules and initial segment of the epididymis (EP). (c) Ciliated cells. Insert in A represents the negative control. After ICI treatment (C, D, G, H), the AR expression was apparently unchanged along the efferent ductules. Bar in A = 50 μm. ICI 182,780 treatment resulted in a dramatic decrease in ERα in the rat efferent ductules, but no detectable changes were found for ERβ and AR. This study further demonstrated that ERα and ERβ respond differently in the male genital tract to this antiestrogen treatment. In addition, the present findings extend earlier data showing that these nuclear steroid receptors are expressed in the efferent ductules. However, the efferent ductule epithelium from the proximal to the distal region showed differential staining. ERα, ERβ and AR cellular distributions found in the adult rat efferent ductules and testis were consistent with those previously reported [3, 32, 37, 40–48]. However, the present study found increasing expression of ERα and AR from the proximal to the distal region of the efferent ductules, in contrast to prior studies. The significance of this differential staining of steroid receptors along the efferent ductule epithelium is not known. However, we have previously observed an expression pattern for the sodium/hydrogen exchanger (NHE3) protein that is similar to the ERα and AR staining . It is noteworthy that an opposite pattern of staining was observed for ERβ. NHE3 appears to be one of the most important molecules in mediating fluid reabsorption in the efferent ductules [12, 49]. NHE3 expression in the efferent ductules has been shown to be regulated by estrogen at the protein and mRNA levels [12, 26], therefore differential expression of NHE3 and ERα is consistent with these prior physiological studies. The immunohistochemical demonstration of cytoplasmic staining for ERα in the ciliated cells of the efferent ductules was an intriguing observation. Although previous studies [1, 2, 37] did not discuss this difference, a reexamination of figures published by Hess et al (1997b) and Nie et al (2002) showed cytoplasmic staining in the ciliated cells from the rat and cat, respectively. ERα cytoplasmic distribution has also been described in other tissues [50, 51]. It was shown that different accessibility of the ER to the reagents depending upon the functional activity of the estradiol-controlled cells could interfere with subcellular immunolocalization of the receptor [50, 52]. In agreement with this finding, ERα and ERβ were more frequently localized to the cytoplasm of resting uterine cells  and human breast cells . In addition, species differences in the ERα staining of efferent ductules epithelial cells has also been noted, with goat and primate ciliated cells being negative [37, 53]. In this sense, one possibility is that ciliated cells of the efferent ductules have a lower requirement for estradiol-induced activity than do the nonciliated cells. This would be consistent with the known function of efferent ductules, reabsorption of 96% of the luminal fluid , which is more dependent on the nonciliated cells than the ciliated cells. ICI 182,780 decreased the expression of ERα in both testis and efferent ductules, but ERβ and AR were not altered by the treatment. The down-regulation of ERα protein following ICI treatment has already been described in other tissues, but most of the studies were performed on female reproductive organs or cell cultures [55–58]. The down-regulation of ERα protein by ICI is thought to be due to a change in the ERα conformation, which leads to a rapid loss of the receptor [55, 59, 60]. At first, lysosomes were thought to serve as the organelle that degrades ERα after estradiol or antiestrogen treatment [51, 61]. However, recent in vitro experiments provided evidence that the ERα degradation occurs through the 26S proteasome pathway, but not lysosomes [62–64]. In the present study, the reduction in ERα nuclear staining after ICI 182,780 treatment was not followed by an increase in the cytoplasmic staining of the nonciliated cells, as described for other cell types in vitro [57, 65, 66]. However, a transient increase of nearly 170% in lysosomal area in ICI-treated rat nonciliated cells was recently described [25, 26]. Thus, further study of proteasomal and lysosomal degradation of steroid receptors in the male is warranted. The fact that ERα, but not ERβ, was down-regulated by ICI 182,780 in the rat efferent ductules, suggests that the ER subtypes are regulated in a different manner in this tissue. In agreement with our results showing approximately 60% decrease in the ERα level after ICI-treatment, other have shown that ICI 182,780 is similar to estradiol in its ability to decrease its receptor approximately 50% [62, 64]. This effect differs from that of the partial ER antagonist Tamoxifen, which was incapable of down-regulating ERα, suggesting the existence of ligand-specific regulation of ERα . These data may also be helpful in the development of an appropriate antiestrogenic chemical that targets ERα function selectively in efferent ductules of the male reproductive tract, permitting the development of a novel male contraceptive. Differential regulation of ERα and ERβ should not be surprising, because regardless of their structural homology , several functional differences between both ER subtypes have been found [19, 20, 22, 67]. In addition, there are now reported several differential effects of ICI 182,780 on ERα and ERβ [16, 28, 68–71]. In support of our results, neonatal diethylstilbestrol (DES) treatment has also shown differential changes in ERα, but not ERβ immunoexpression in the male rat reproductive tract . In contrast to the data presented here, which suggests that ERα does not have a direct regulatory effect on AR expression in testis and efferent ductules, in the prostate gland AR has been shown to be down regulated by estrogens in a lobe-specific manner during development [38, 72]. Although the prostate effect appears to be mediated through ERα, as AR expression in the α ERKO male is normal even following DES treatment , ERβ cannot be ignored because DES treatment of the β ERKO males during the perinatal period also induced a lobe-dependent decreased expression of AR . ERβ expression in the male reproductive system is rather extensive [1, 14, 30, 43, 44], but targeted disruption of ERβ has not resulted in any significant pathogenesis in the male [11, 13], and estrogen and antiestrogen treatment has not caused effects on the expression of ERβ. It has been proposed that ERβ modulates ERα effects in the uterus [13, 73, 74] and cervix , but currently, the role of ERβ in the male tract remains uncertain. A recent study using α ERKO and ICI-treated normal and α ERKO mice  attributed to ERβ a role in mediating the estrogen down-regulation of several ion transporter (CFTR, DRA and NA/K ATPase). However, they did not account for the maintenance of ERβ expression and possibly functional activity in α ERKO and after ICI treatment. 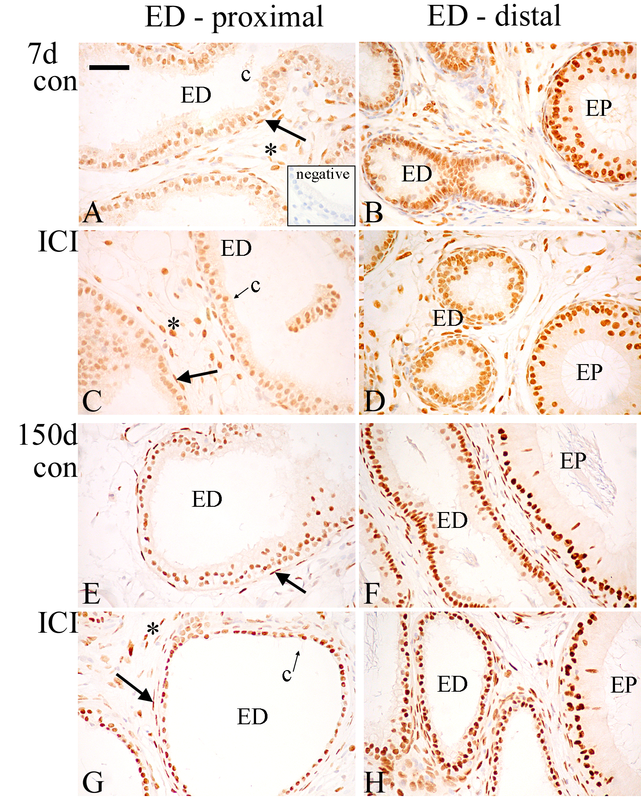 The results obtained by treating adult male rats with the pure antiestrogen ICI 182,780 show that ERα and ERβ expression are regulated by different mechanisms in the testis and epididymis. ICI 182,780 binds to both receptors but only causes the disappearance of the ERα protein. The expression of AR was unaffected by the antiestrogen in testis and epididymis. We are grateful to the generous supply of ICI 182,780 provided by AstraZeneca, Macclesfield, UK. This research was supported in part by NIH grant number HD35126 (RAH) and CONRAD. CAO helped to design the study and carried out the experiments and wrote the first draft of the manuscript. RN assisted with the immunohistochemistry. KC provided laboratory assistance. LRF helped in the design of the study and served as advisor to CAO. GSP provided the AR antibody and consultation in its use. PTKS provided the ERβ antibody and consultation in its use. RAH served as PI on this project and helped with study design. All authors read and approved the final manuscript.